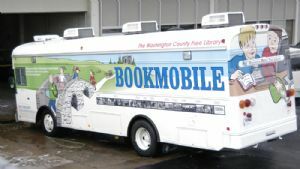 The newest bookmobile has a book capacity of 4,000 titles, a handicapped lift, four computer workstation outlets, air conditioners and heating, and an awning with outside lights. It is 32 feet in length. The Bookmobile was manufactured by OBS and has a Blue Bird Body.